That’s not to knock those suit wearers in the magazines that notice these extreme subtleties…it’s just not my way. I know what I like and I like what I smoke. Plain and simple. Now that we got that out of the way, let us move on. 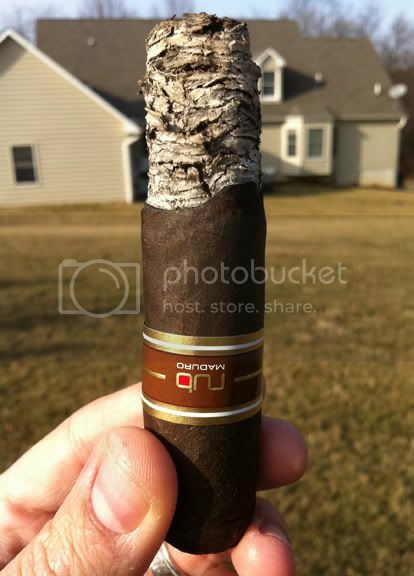 The Nub brand of cigars are something very special. Cigars International sums up the Nub idea perfectly. At first glance, the inexperienced will feel they got ripped off…a gimmick, if you will. The small, stubby stogie appears as if some penny pincher took a “normal length” cigar, cut it in half and re-wrapped the halves for individual sale. Well, as we all know, looks can be deceiving. What seems like it will be a quick, 10 minute smoke ends up giving you over an hour of pleasure. This is due to the Nubs fantastic construction and extreme girth. There is so much delicious, densely packed long filler tobacco stuffed into these little monsters that by the time you are finished smoking you will swear that you just polished off a churchill and your jaw could very well use a rest if all you are used to is smoking lonsdale sized cigars. But enough of the background story. Let’s get back to the reason you are here…reading this. A review, yes?! 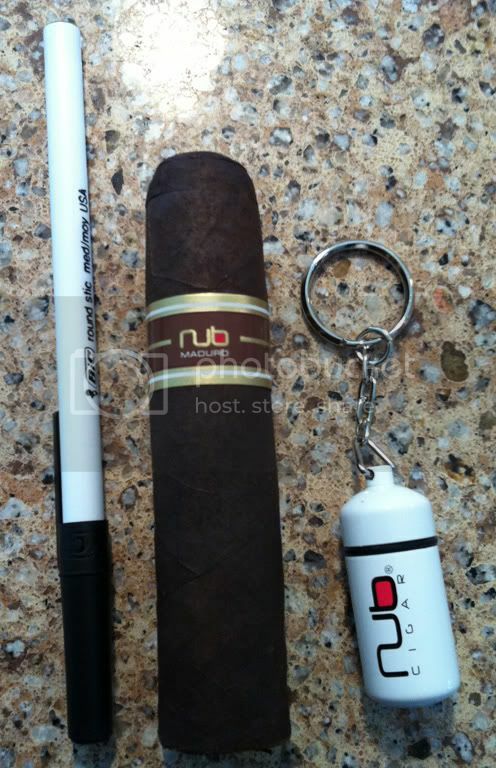 So, while Studio Tobac offers many varieties of delicious Nub branded cigars (and I encourage all of you to sample them all) today I will be concentrating on the limited Edition San Andreas Maduro. After peeling the cellophane off, I was greeted with that rich brown color that I have come to love from the standard Nub Maduros. It had a nice, oily sheen to it along with very light veins in the leaves. What I noticed most was how “toothy” this thing looked. I took a wif of the wrapper and I got a strong, “barnyard”, earthy smell. Don’t take that the wrong way, all those smells were pronounced in a good way. Kind of like what you would expect the step father of Mother Natures cologne to smell like. I used a punch cutter to “open her up” and my initial thought before lighting this thing was “DAMN! This thing is huge” (editors note: I immaturely giggled here, a lot). The noted size was 4×64 (length x gauge), but it felt bigger…borderline robusto. I’m not sure if the gauge played tricks on my eyes, but it really didn’t feel, or look, like the Nubs I was used to. It lit up effortlessly and even though there was so much tobacco packed in, the draw was smooth and easy. I initially thought that it didn’t taste much different from the standard Nub Maduros, which definitely isn’t a bad thing but I was expecting something different; however, it didn’t take too long for that to happen. It had a pleasant, yet subtle, burnt dark chocolate taste for the first half. I was surprised because I was expecting a more natural and earthy taste from my initial smell of the wrapper, but that just wasn’t the case. Before I knew it, it took on somewhat of this light fire roasted marshmallow undertone. A bit of a subtle sweet vanilla char, if you will. I really enjoyed it. I usually don’t pass my cigar on to someone to “try” because I see that as smoking faux pas, but I just had to. I let my cousin Dave take a few puffs and he was floored. I believe his actual quote was “Holy sh*t, this is delicious”. When someone uses the word “delicious” in regards to a cigar, you know you have something special on hand…ignoring the bro-dog at his kegger rambling on about how “delicious” his grapefruit infused Phillies blunt is. The flavor didn’t vary too much after that. It kind of bounced between the two flavors I noticed early on throughout, which I absolutely enjoyed. I know many “cigar aficionados” out there complain in their reviews when cigars don’t constantly evolve or change flavor every minute. I never understood this. If you like a cigars flavors, and it sticks with THOSE flavors, then whats the problem? More of whats good! The cigars burn was, for the most part, razor sharp. There was instance (you can see in the pic below) that it got slightly uneven; however, it took only a brief flame correction to get her back on track. The ash was really nice, and unfortunately these pictures don’t do it justice. It was a nice bright gray. The contrast against the dark wrapper is almost an art. It stayed straight and strong almost to the band and then a gust of wind gave it that push it needed to plummet to the ground. 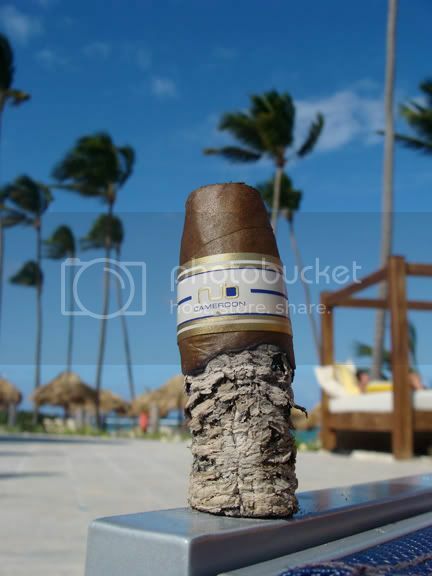 No bother though, I just missed my chance for a stellar “Nub stand” that the Nub cigars have become so famous for. I was worried that since the ash had fallen the cigar would be more prone to go out leading to the constant dreaded relights that kill a cigar. Thankfully, holding up to the wonderful Nub resume, she burned till the end. In closing, this really was a good smoke. IMO, even better than the standard Nub Maduro. I wish I had another in my humidor to see how it stacked up to my first. But because of its limited availability, its just not in the cards. Thats right, I just reviewed a cigar that you can’t buy. I’m special, you are not. Deal with it. So, If you come across one at a show, online, or maybe hidden in a laser guarded treasure chest at your local smoke shop, grab it and run.